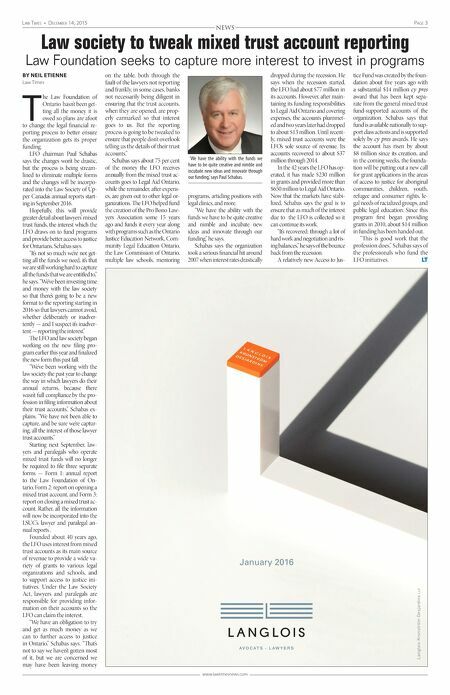 Page 2 December 14, 2015 • Law Times www.lawtimesnews.com NEWS Length of LSUC investigations ticking upward BY NEIL ETIENNE Law Times he chairman of the Law Society of Upper Can- ada's professional regu- lation committee says while the number of complaints against lawyers and paralegals seems to be maintaining an even keel, the time it takes to investigate and conclude matters is becom- ing a concern, although not at the point he's willing to call it a trend. Statistics that Malcolm Mercer presented to Convocation Dec. 4 during his quarterly report show the median age of complaints in the LSUC investigation depart- ment's queue reached a high of 308 days in the third quarter of 2015 (July 1 to Sept. 30), up from 228 in the same time frame of 2013 and 246 in 2014's third quarter. e policy target is 240 days. "I come to you not intending to alarm you, but I do come intending to concern you," Mercer told Convocation during its final meeting of the year. "We're not processing matters as quickly as we were and we're not keeping up with the intake." In an interview with Law Times, Mercer explains that the number of complaints to the LSUC has been fairly consistent at around 4,800 per year. Of those, about a third are dealt with by the complaint resolution department. ese are less serious complaints that typically do not require a dis- ciplinary hearing. Mercer says of the 4,800 com- plaints, only about 150 ever reach the disciplinary tribunal, but the time it takes to investigate the mat- ters is creeping up. e total active inventory of cases has been slowly rising to 3,609 at the end of the third quar- ter of 2015 from 3,225 in the third quarter of 2013. "At any point in time, if you were to ask 'How many complaints is the law society dealing with?' it would be something in the range of 3,000 to 3,500. at tells you it takes on average, two-thirds of a year to process your average com- plaint," Mercer explains. e complaint department's inventory fluctuates more than its investigation department counter- part, but ended the third quarter of 2015 with about 304 active files, similar to the 317 it had for the third quarter of 2013. Nonetheless, there were significant jumps to 409 active files in the fourth quarter of 2014 and another high point of 391 in the second quarter this year. Complaint resolution has been able to maintain a fairly even aver- age of about 240 days to complete a matter, but the investigation de- partment is seeing greater pressure to maintain its averages. "e investigations side is call- ing on the assistance of the com- plaints resolution group for some extra resources. e inevitable ef- fect of that is that they've started to get behind with dealing with their work," Mercer says. He says there are a number of potential factors, adding it's a situa- tion that will be monitored closely over the next quarter or so to de- termine if this is a full trend or if it's just a "bump" in the numbers. He says there are several po- tential factors to the increase in investigation time, including that matters being investigated are be- coming more complex. "It may be simply that you need more resources because over time, while things are coming at you at the same rate, you're not able to process them as quickly as you should," he says. "ere is some suggestion that we are receiving complaints that are more complicated to investigate in that they have multiple clients or multiple issues." LSUC CEO Rob Lapper said during Convocation that the use of interlocutory suspensions and restrictions are becoming more common. With an increased focus on managing risk when lawyers are being investigated, it comes with a greater demand on time and resources. "at would be an explanation why, when the number of cases coming in is relatively constant, they're taking longer to process," Mercer says. Another factor Mercer points- to is that the LSUC has a greater focus and appreciation of mental health issues for lawyers and other legal professionals facing an inves- tigation. e mental health task force is becoming increasingly involved in the investigation pro- cess, again adding more time. "ose can be complicated to deal with, but it's appropriate they be dealt with and they take more resources and extra time," Mer- cer says. "Staff is aware and in fact raised the issue; staff are now pro- ceeding to address it. It may mean that extra resources will need to be brought to bear or it may mean that we should just watch a bit and see whether or not we're seeing a trend or the inevitable movement up and down over time." Disciplinary tribunal chair- man David Wright says the issue of how long investigations are tak- ing doesn't seem to be affecting the length of the tribunal disciplinary process, although he adds that some of the matters are becoming more complex. "We've been working really hard to reduce length of the matters be- fore the tribunal," with things such as pre-hearing conferences to nar- row issues, using adjudicators, and promoting resolution through joint submissions," he says. "I think the complexity of discipline and licensing matters is always increas- ing because the world is becoming more complex and the legal world is becoming more complex." Wright says the variety of mat- ters at the tribunal is increasing and several recent mortgage fraud matters, in particular, had been slowly working their way through the process. "ose were particularly com- plex and we're seeing different kinds of issues come before the tri- bunal, [such as ] refugee law matters or other related issues, but overall I think there's always a mix of legally complex, factually complex, and other matters that may be straight- forward," he says. "Certainly, we're working hard at the tribunal level to shorten our hearings and I think we're having a fair bit of success." Brian Radnoff, a partner at Le- rners LLP and frequent counsel in disciplinary matters, observes that some matters that reach the tribu- nal move quite quickly, while oth- ers seem to drag on "far too long." He says the impact to a lawyer facing a lengthy investigation pro- cess can be emotionally draining and stressful while they are also restricted from conducting cer- tain roles, such as being an arti- cling principal. While the hearing process is fairly efficient, he says, part of the problem of time and an increasing inventory might rest in the hard stances the tribunal takes on some matters, such as mort- gage fraud. "Because the penalties for knowing assistance in mortgage fraud can be quite severe . . . you're going to get more lawyers fighting things and that means more hear- ings on complicated, long, drawn- out matters. "My concern is that the law society, in prosecuting these dis- cipline matters, has to be more flexible. ere has to be some un- derstanding that not every case is the same and that a negotiated so- lution is always better than a con- tested one." Lapper told Convocation "we are paying very close attention" to the issue. "Complaints generally fluctu- ate from year to year, but the good news, if there is any in that, is that frankly our complaint numbers, our intake numbers, are actually very stable," Lapper said. "When one considers that the absolute numbers of our professionals are rising, the fact we have stble com- plaints numbers at least suggests that the ratio is good." LT Nothing in the cyberworld can be trusted or taken for granted − not by the individual computer user or by global enterprises invested in the latest technologies. 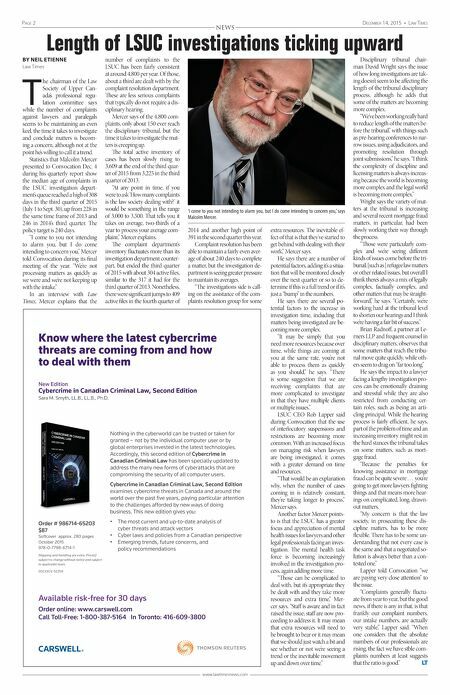 Accordingly, this second edition of Cybercrime in Canadian Criminal Law has been specially updated to address the many new forms of cyberattacks that are compromising the security of all computer users. Cybercrime in Canadian Criminal Law, Second Edition examines cybercrime threats in Canada and around the world over the past five years, paying particular attention to the challenges afforded by new ways of doing business. This new edition gives you: • The most current and up-to-date analysis of cyber threats and attack vectors • Cyber laws and policies from a Canadian perspective • Emerging trends, future concerns, and policy recommendations New Edition Cybercrime in Canadian Criminal Law, Second Edition Sara M. Smyth, LL.B., LL.B., Ph.D. Know where the latest cybercrime threats are coming from and how to deal with them Available risk-free for 30 days Order online: www.carswell.com Call Toll-Free: 1-800-387-5164 In Toronto: 416-609-3800 Order # 986714-65203 $87 Softcover approx. 280 pages October 2015 978-0-7798-6714-1 Shipping and handling are extra. Price(s) subject to change without notice and subject to applicable taxes. 00233GV-52258 T 'I come to you not intending to alarm you, but I do come intending to concern you,' says Malcolm Mercer.